The Islamabad Capital Territory (ICT) Police in collaboration with Higher Education Commission has taken new initiatives to introduce technology-based policing and encourage students of Higher Education Institutes to come forward with innovative ideas that can be useful for the police. In this regard, the ICT police and HEC have organized National Police Summit and Innovation Expo on 14th March 2018 at Jinnah Convention Center, Islamabad. The key objective of Technology Innovation Expo was to raise awareness among key stakeholders including security organization, parliamentarians, diplomats, business entrepreneurs, bureaucrat’s policymakers educationist and researchers, both faculty as well as students and members of the civil society about the significance of innovation and research in the field of security. Through an active engagement of key stakeholders and decision makers from the governments, various universities as well as entrepreneurs both successful and aspiring, HEC thus hopes to make a dent in the surface in term of inspiring the youth to trust their ideas, preserve to see them grow and ultimately creating rather than seeking jobs. In result, they will serve as an opinion leader and provide an impetus leading to a national pledge to be taken to promote university-community and university-industry linkage and technology transfer for building a strong Pakistan. Universities were requested to send the relevant projects/ideas to showcase them at the event. 100+ Projects/Ideas were received from Universities across Pakistan which had been shortlisted and invited for presentation at Higher Education Commission on 12th March 2018. The panel of Judges included Members from Higher Education Commission and Senior Officials from Law Enforcement agencies/Police. 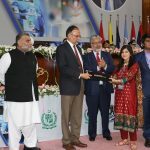 Business Incubation Center, Bahria University Islamabad submitted Five Innovative projects relevant to Law Enforcement Agencies/National Police for competition/Innovation Expo. Through rigorous shortlisting process and presentation session, Project Titled “Point to Point Visible Light Communication (VLC) / Li-Fi” won First Prize and received cash prize Rs. 100,000/- out of 112 startups from Universities across Pakistan. 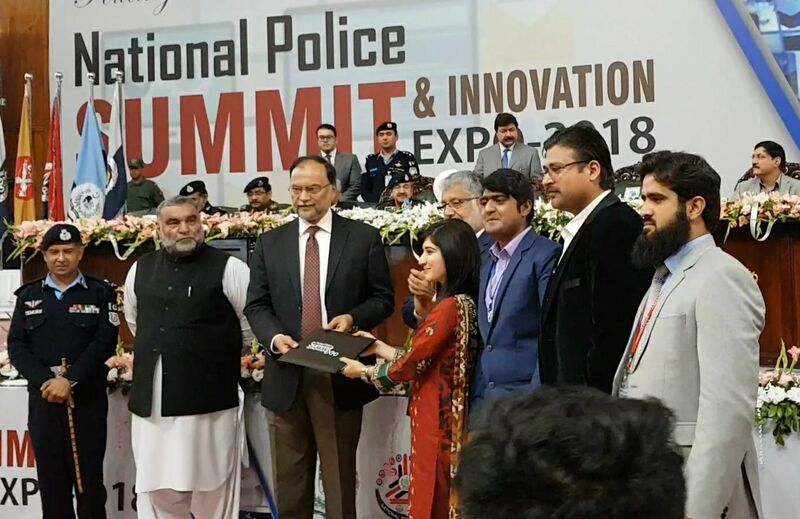 Honorable Minister for Interior Prof. Ahsan Iqbal, Chairman Higher Education Commission Dr. Mukhtar Ahmed along with Senior Officials from National Police and Law Enforcement Agencies were present at the occasion and appreciated the efforts being done by Students of Bahria University Islamabad. Momna Abid, M. Waleed Ijaz, and Shehroz Khan are Students of Computer Engineering Department at Bahria University, Islamabad. Their Project Li-fi is virtually incubated at Business Incubation Center, BUIC to further develop it into a commercial product. Li-fi uses light as a medium to transfer and receive data. This system is using the environmental and eco-friendly medium of transfer ‘light’ for the sharing of data through mobiles, laptops and other electronic instruments. Energy consumption can be minimized with the use of LED illumination which is already available in the home, offices, and Mall etc. for lighting purpose. Li-Fi not only requires fewer components for its working but also uses only a negligible additional power for the data transmission. Since light cannot pass through opaque structures, Li-Fi internet is available only to the users within a confined area and cannot be intercepted and misused, outside the area under operation. Li-Fi technology has a great scope in future. The extensive growth in the use of LEDs for illumination indeed provides the opportunity to integrate the technology into a plethora of environments and applications.